"You're not paid to think!" Our daughter brought home some plans for an NJROTC flag stand and this is what we came up with. The old one shown at right had served its purpose well but has grown tired and too small for the collection of flags the unit employs. Leana and the Commander drew up some simple plans for the new stand and we went to work. There is a small space in a corner for the stand. A drain pipe and existing bench dictated the height and shape of the finished piece. 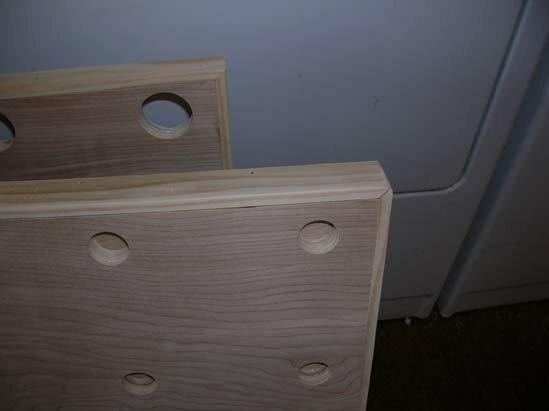 We cut three pieces of 3/4-inch birch plywood to make the main levels. 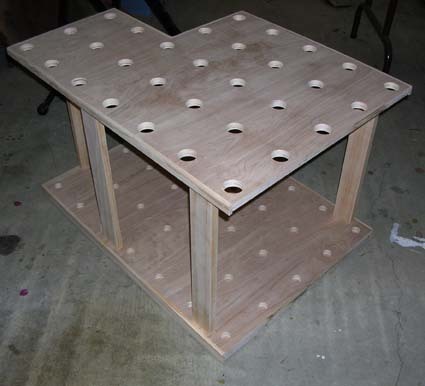 Hole locations were determined by the number of holes needed and overall space available on the piece itself. 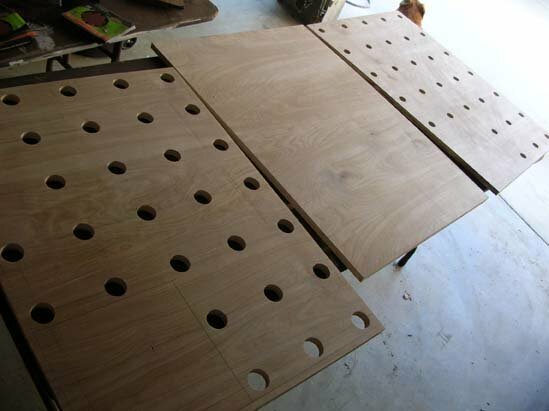 Once carefully drawn onto the wood, our dimensions were checked again and we drilled the top holes at 1 1/2 diameter. 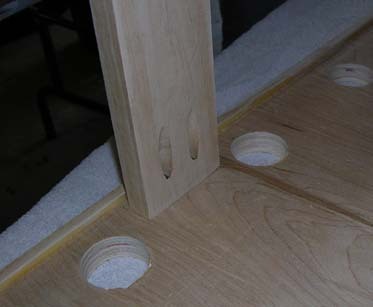 Holes on the lower platform are drilled at 3/4-inch to better direct and hold the pointed end of each flag pole. We left the lower platform as a solid piece to keep from poking through to the floor. The 2 lower pieces are glued and screwed together. Rather than risk hole misalignment due to a drawing error, we drilled the top then laid one piece on top of the other and used our 1 1/2 bit to mark the centers for the lower holes. Of course we did this before gluing the bottom pieces together! Here's a good look at our NJROTC flag stand in place. You can see that we managed to fit the available space. The existing corner pipes can be seen in the picture below. 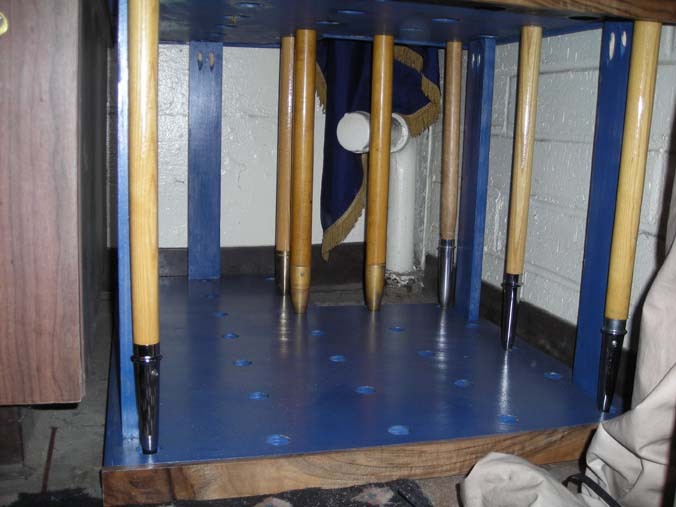 We went with Ocean Blue wood stain because this is a Navy JROTC flag stand after all. We cut 2 thin strips of walnut trim for the front to add a little color and character. Three coats of urethane form a nice protective finish. 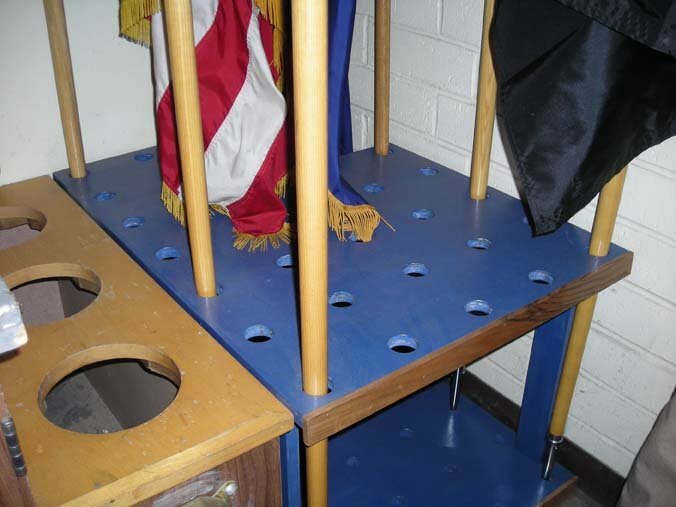 If you don't have a high school unit nearby, you could make a smaller version of this NJROTC flag stand for pencils on your desk. 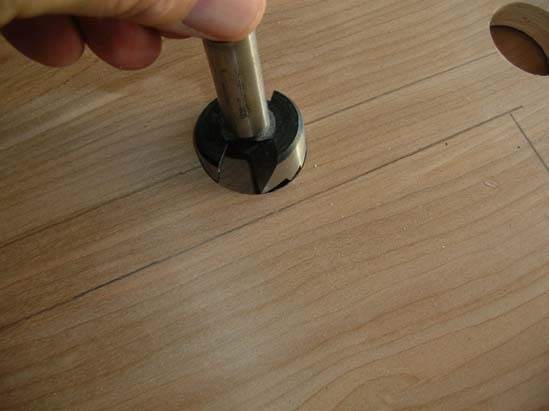 The pencil project would make a very good beginner woodworking project for a young child.